So, what was Luke up to this summer, besides writing mad code at everyone's favorite online music startup, Gigabeat? Well, as a card-carrying member of the ole Navy ROTC program, I'm sent out every summer on a "cruise" to go learn about the Navy. Now, I know when most people hear the word "cruise," they think Club Med, sipping piña coladas by the pool, and visiting exotic places. However, only the last is true (in some cases, anyhow...back in the day they used to send midshipmen out to Norfolk, VA for the whole summer; perhaps that's "exotic" for a Yankee like myself, but still not exactly a "destination port"). Especially for one's second-class, or "dungaree", cruise--so called because one performs duties of a junior enlisted person, who wears dungarees--most of one's day is spent working, often doing manual labor. Also, the accomodations aren't exactly four-star: the food, while often quite good (we had lobster and steaks one night), is usually worse than what you'd find in a college dorm; the beds (or "racks") are appropriately-named metal "coffins" which are stacked three to a bunk, giving little room in any dimension; one is woken up at 0600 or 0700 (that's 6 or 7 AM for you civilian types) by whistles, bells, and calls for "reville"; the showers have limited water, which vacillates between scalding hot and freezing cold; etc. But don't feel too sorry for me yet! I had an awesome time on the USS Austin, both on and off the ship. 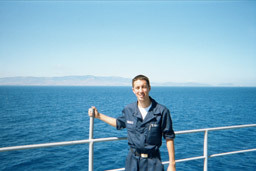 On the ship, I got to work with both the Operations and Engineering departments, learning how the ship works, meeting sailors of different backgrounds and ages, and above all getting to "step into the moccasins" of people whom I might be leading in a few years. Off the ship, we had some great port visits, all of which were "liberty" (that is, non-working) ports thanks to our great skipper's pro-sailor philosophy: Málaga, Spain; Cannes, France; and Civitavecchia, Italy (not far from Rome). It being my first time in Europe, it was quite a thrill...especially the chance to finally put my high school French to good use!